Many Pagans like to make their own magical and ritual tools. Creating things by hand is a great way to incorporate your own magical energy into your tools and supplies. Here are some of our most popular magical craft projects, with items for your altar, a ritual robe, your Book of Shadows, an altar pentacle, and more. 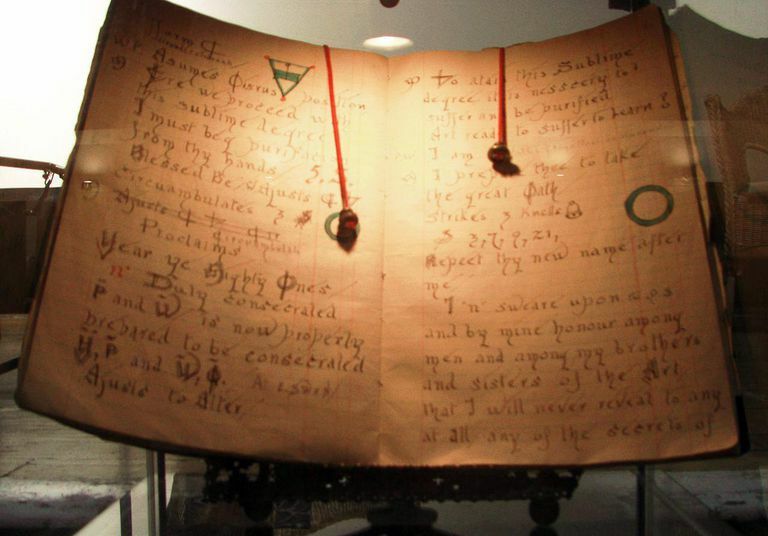 In many forms of Paganism, it's traditional to create a Book of Shadows, which is a notebook containing information regarding your tradition, gods and goddesses, correspondence tables, sabbat and esbat rites and rituals, magical recipes, and more. Although some traditions have a "coven Book of Shadows," most solitary practitioners write one of their own. Learn how to make your own BOS here. Although many Wiccans and Pagans prefer to practice skyclad, sometimes it's just not practical -- and that's when you need a good ritual robe. For many people, donning the ritual robe is a way of separating themselves from the mundane business of everyday life -- it's a way of stepping into the ritual mindset, of walking from the mundane world into the magical world. Most people prefer to wear nothing at all under their ritual robe, but do what is comfortable for you. You can assemble a simple ritual robe by following these basic steps. The besom is the traditional witch's broom. It's associated with all kinds of legend and folklore, including the popular notion that witches fly around in the night on a broomstick. In addition to being good for playing Quidditch, the besom is a great addition to your collection of magical tools -- it's used in many traditions as a method of cleansing or purifying a space. While you can certainly buy one in a store, there's some degree of satisfaction in making your own. Learn how to create a besom with natural items in just a few steps. The pentacle is one of the most commonly used magical tools in the Wiccan religion, as well as in some traditions of Paganism. Typically, it is used on the altar as a place to hold items that are about to be ritually consecrated or charged. In some traditions, the pent represents the element of Earth. There are many absolutely beautiful pentacles available commercially, made of wood, tile, metal, ceramic, and just about every other type of material. However, it's not hard to make a pentacle of your own. Many Wiccans and Pagans like to create a portable altar kit. This can be handy if you travel a lot, or if you just like the idea of being able to put your stuff away quickly when guests come over. Learn how to assemble a simple altar kit that you can take with you wherever you go. Many Pagans use a wand as a method of directing energy during spellwork or ritual. Because quartz crystals are known as natural energy conductors, you may want to incorporate one into the construction of your own wand. Here’s how you can make a simple quartz crystal wand of your own. The witch's ladder is a magical tool that has been around for a while. You can use it in spellwork, meditation, or for any other sort of ritual working. Learn how to make one with items you probably already have lying around your home!